George was born in North Hyde, Southall, Middlesex on 25 January 1874 and was christened at St John’s, Southall Green on 7 March as Alfred George Leather, however the birth was registered as George Alfred and he was known as George. His father William was a garden labourer, but was not in the fixed employment that a post at a large house might offer; the family moved around the Southall/Uxbridge/Staines area as he moved from job to job. George had three siblings: William Thomas (born 1867), Ada Martha (1871) and Alice Mary (1876). In 1883 their mother Mary (née Baldwin) died, young Alice was only seven and George nine. order to his birth registration. Following his schooling (the leaving age was only ten) George followed his father into the gardening trade, but seemingly more successfully. He worked at a market garden in the Southall area and over time became a manager (though the source for this is a little suspect). He also met a young lady from Newbury, Alice Mary Bowley, who was working at Albion Lodge, Heston as a servant for John Neighbour, a market gardener – very possibly George’s employer. George and Alice were married in Newbury on 12 December 1896 and set up home in Southall. In 1900 only first child, Dora Gladys, was born on 5 December. It seems that market gardening in Southall was not enough for George; he was ambitious, probably wanting to run his own business. This would be difficult in Southall, but there was always room for ambitious young men in the colonies. George decided that he would try his luck in New Zealand. On 9 December 1910 he set sail on the SS Athenic bound for Wellington. He found work in Morrinsville (south of Auckland, near Hamilton) and then at Kaiwaka (north of Auckland) where he was working for Mr T Coverdale at the time he enlisted. Alice and Dora remained behind in England initially boarding with George’s sister Alice and her husband Alfred Fletcher in Southall. 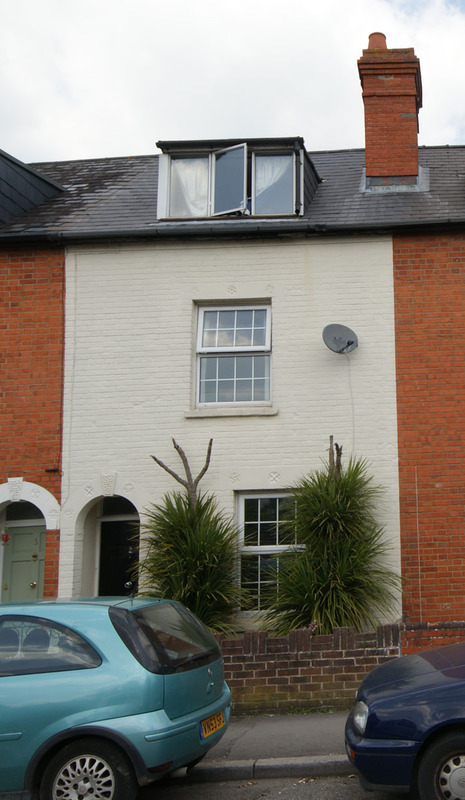 After a time she moved back to Newbury, first to 2 Berkeley Terrace (2 Berkeley Road) which she shared with the approriately named Mrs Tanner. Much of what is known about soldier’s lives before the war is teased out of hints given in their obituaries; in George’s case this is difficult because the obituary (below) is full of inconsistencies. For instance it states that he was managing a market garden in Southall – which makes the decision to emigrate and work as a garden labourer a little strange. Then there is a tale of repeated attempts to come back to England to collect his wife and child, prevented by the New Zealand authorities not allowing a man of military age to leave; yet George was 43 by the time the war began, beyond what was considered to be ‘military age’. He is then supposed to have been ‘ordered’ to join up. He did join up on 23 August 1916 – was he ordered to? He doesn’t seem to have been reluctant; he even went to the extent of knocking seven years off his age in order to get into uniform. One is forced to wonder if he had ever had any intention of reuniting with his family. However, he was reunited for a few days. After signing up he was allocated to A Company Auckland Infantry Battalion (20th Reinforcement) and given some basic training before leaving New Zealand from Wellington on the SS Port Lyttelton on 7 December 1916. He landed at Devonport on 18 February 1917 and was sent to Sling Camp at Bulford in Wiltshire for more training (most of the training of colonial troops took place in Britain). However, George was not there for long, after a few days leave to visit his family he crossed the Channel to France on 14 March and arrived at the New Zealand Infantry Base Depôt at Etaples on 17 March. There he had another month of training before being posted to the 2nd Battalion, Auckland Regiment in the field on 20 April 1917. On 1 October the three Auckland battalions marched through Ypres (Ieper) on their way from a rest/training camp to the line north of the battered town. Intelligence had been received that the Germans were planning a big counter-attack on the morning of 4 October aiming to recapture ground lost during the previous months in earlier stages of the great battle that had been underway since 31 July (the 3rd Battle of Ypres often referred to simply as Passchendaele). 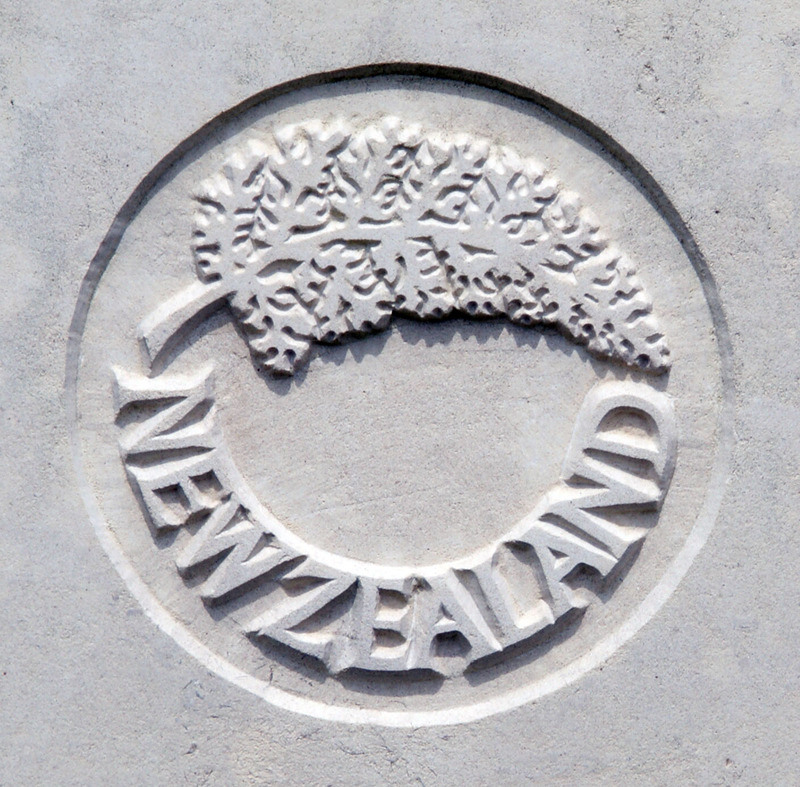 The regimental badge of the Nwe Zealand Expeditionary Force, as used on CWGC headstones. The intelligence was good, the New Zealand Division where in place and ready, but they weren’t going to sit tight and defend; they were to pre-empt the German assault and attack themselves. The 2nd Aucklands were in the second wave on the night of 3/4 October they moved forward. 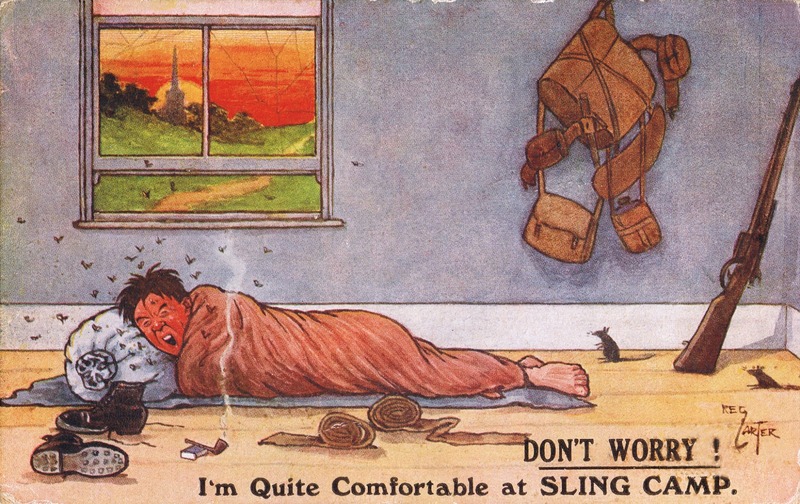 Zero hour was 6am – ten minutes before the German’s were due to go over the top. The massed artillery opened up and rained hell down on the enemy grouped together ready to attack. The New Zealanders set off, across a muddy swamp where the Hannebeek used to flow and into the German positions. Every now and then a pillbox would hold up the advance until men could work their way around it – a Lewis gun team would pour fire into the gun slit until another team could get close enough to lob a few grenades in through the same slit. This was not the raw army that were slaughtered on the Somme, the British and their comrades from the Empire had developed effective tactics to deal with enemy defences that themselves were far more sophisticated than found on the Somme a year earlier. Nevertheless many men died – not only on the German side. The 2nd Auckland’s suffered 260 casualties – 41 killed, 179 wounded and 40 missing; over a third of their number. Among the men reported missing was George Leather. A comrade had seen him fall; he was known to be wounded – on 6 October he was reported as ‘missing believed wounded’. Five days later there was more information that led to the conclusion that he had died; perhaps a different comrade had seen him dead, perhaps his body was found in the aftermath of the attack. LEATHER – Oct 4, killed in action, Pte George Alfred Leather, Auckland Infantry, New Zealand Force, dearly loved husband of Alice Mary Leather, 2 Berkeley-terrace, Newbury, aged 43 years. Mrs A M Leather, of 2, Berkeley-terrace, Newbury, had been notified of the death of her husband, Pte George Alfred Leather, of the Auckland Infantry, New Zealand Force. Formerly he was managing a market garden at Southall, and seven years ago went to New Zealand. Meanwhile, his wife, who is a daughter of the late Mr George Bowley, of Long Lane, came to live in Newbury. Her husband was arranging to fetch her and daughter, and had booked several times for passage to England, but being of military age he was not allowed to leave the country. He was ordered to join up, and went into camp in August 1916 coming to England in February, 1917. Four days leave at home, and he went to France in March. He had been through several big battles, but on October 4th was severely wounded, and died the same day. Mrs Leather has received letters of sympathy from the King and Queen, also Lord Liverpool, the Governor of New Zealand, the Minister for Defence of the Colony, and from an officer of the Company, expressing similar sentiments. The deceased, who was 43 years of age, was a member of Newbury Baptist Church, and held in great respect by the congregation. The final sentence is another example of the inconsistency of this account – how would a man who had never lived in Newbury be a respected member of the Newbury Baptist Church? Especially one who clearly stated on enlistment that he was a Methodist? If his body was found it was lost again (many were) for he has no known grave; his name is remembered on panel 1 in the New Zealand Apse at the Tyne Cot Memorial. 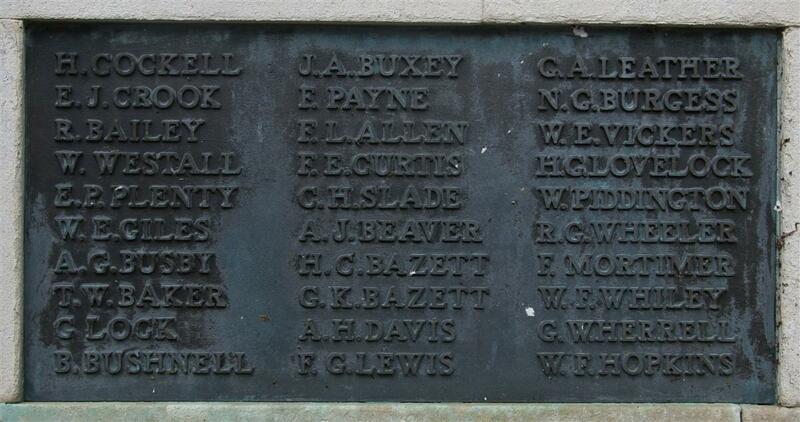 Although George had never lived in Newbury Alice ensured that he was remembered on tablet 9 of the Newbury Town Memorial, the memorial board and roll of honour in St Nicolas’ Church and the brass plaque in the Newbury Baptist Church.